If you are a Bucharest tourist who likes to be authentic, wearing handmade clothes and accessories or creations of young Romanian designers and to discover a unique location, experimentalist, Coquette, far from the chaos of everyday life, then the MODELiER’s Hidden Treasure Party & Fair it’s for you. Participating designers: Mariana Marin, Alin Teglas, Tricouri Antante, Bratara Succesului, Diana Nicolae, Cajoux, Anamaria Niscoveanu si Rox Epurash. "Hidden Treasure @ MODELiER" Fair in Bucharest. 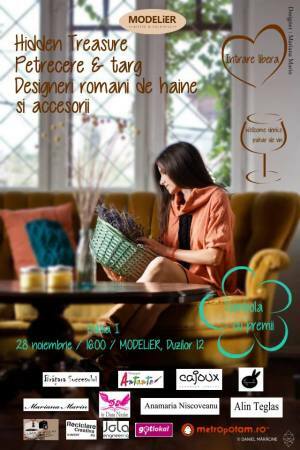 You can get here description, reviews, address, time and details of "Hidden Treasure @ MODELiER" Fair in Bucharest. Visit Bucharest Tips for more Fair events in Bucharest!